My friend and neighbor, Bob Wheeler is a fisherman—a generous fisherman who gladly shares his catch with me whenever he can. He’s brought me tuna that’s fresher than any I’ve ever had and more bountiful than I could ever afford. 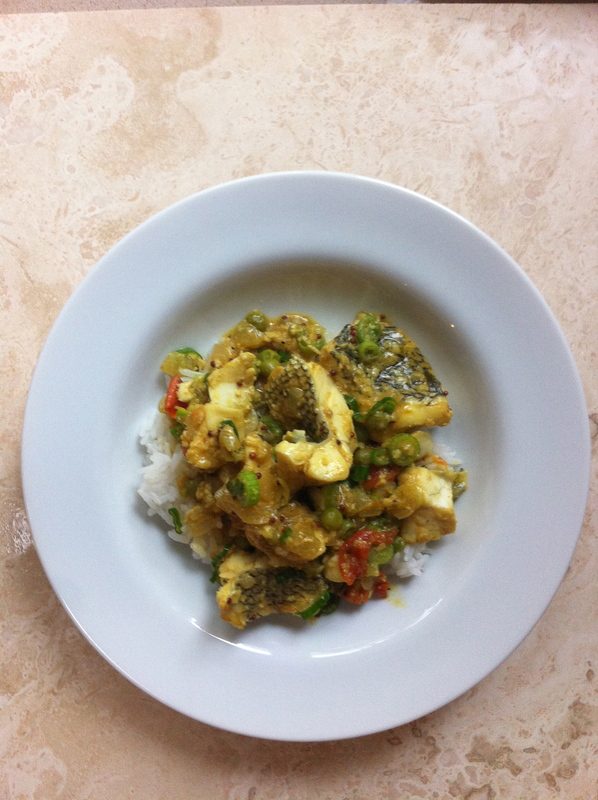 One time, there was enough for 3 dinners and each dish took advantage of the subsequent changing freshness of the fish. Day 1—Tuna Tartar (raw); Day 2—Tuna Salade Nicoise (lightly seared); Day 3—Tuna Burgers (cooked through). All good and all free! 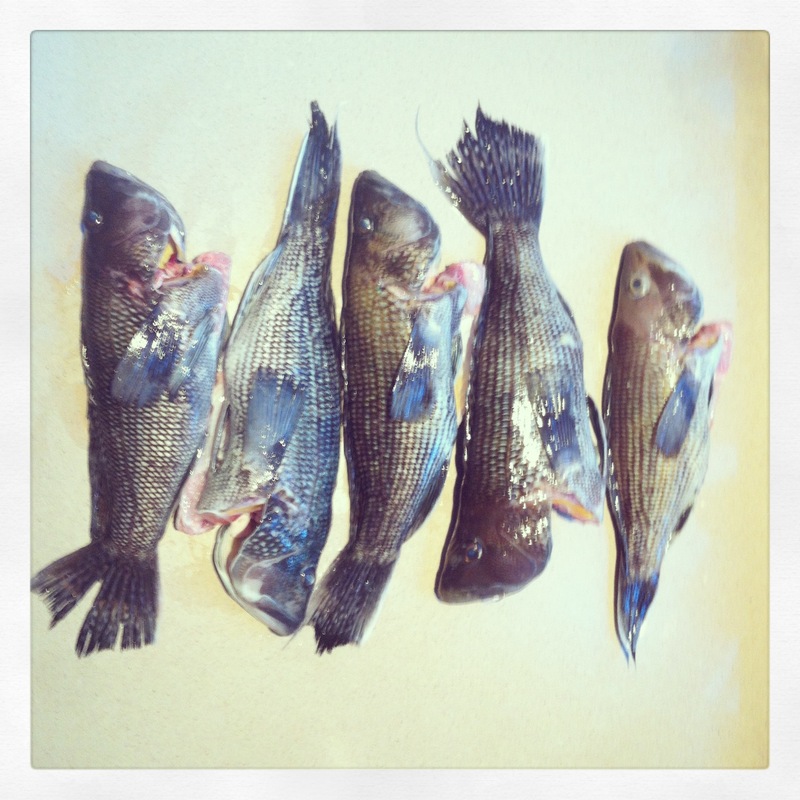 This time he brought me about 5 black sea bass. Thankfully he gutted the fish, though I have been known to clean my own catch, but left the scaling and filleting to me. I don’t mind breaking down fish, but scaling is a messy project. The scales fly all over, landing is some pretty unexpected places—inside drawers (closed!) on window sills but the oddest was inside my coffee pot. How?? Unlike the tuna boon, I wasn’t able to use all the bass right away. I grilled what I could for dinner and vacuum-sealed the rest to freeze for later, knowing that the frozen fish would be relegated to bouillabaisse or fish tacos. (No complaints here!) I was not in the mood for a tomato-y stew or motivated enough to shop and prep for tacos last night, so I checked my pantry for what I did have: ginger, unsweetened shredded coconut, dried curry leaves, a handful of cherry tomatoes and a pint of clam broth that I’d frozen after a clamming excursion last year (a cool story for another time!) Everything I needed for a fish curry. Quickly sautéing the aromatics, then simmering the broth and coconut milk, and finally adding the chunks of fish for the last few minutes yielded a most delicious curry which I served with rice. Three of us devoured what I’d intended for four. Bob gives me fish but what do I give Bob? Where’s the squid-pro-quo? Bob knows that to the core of my being, I appreciate the effort, the adventure and the absolute perfect freshness. I love listening to his fish tales, but he loves listening to my kitchen exploits. Like a proud father, he beams when I tell him what I did with his catch. And even though I don’t have a fishing rod in my hand, he knows that I am a kindred spirit. Heat the oil in a medium enameled cast-iron casserole or large saucepan until shimmering. Add the onion, ginger, jalapeno, and garlic and cook over moderate heat, stirring occasionally, until softened and lightly browned, 7 to 8 minutes. 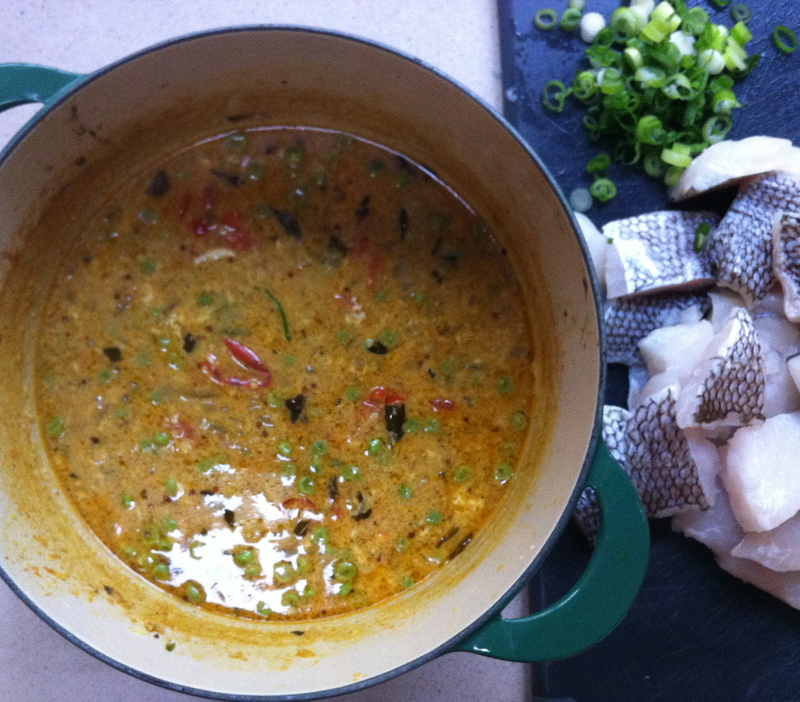 Add the shredded coconut, curry powder, mustard seeds and curry leaves and cook for 1 minute. Add the tomatoes, clam broth and coconut milk and bring to a boil. Simmer over moderate heat until slightly reduced, about 15 minutes. Stir in the corn starch mixture and bring to a boil. Season with salt. Add the fish and peas and simmer just until cooked through, about 4 minutes. Stir in the scallions and serve with rice.